Implementation of an ISO 50001 standard within an organisation is aimed at enabling a systematic approach in achieving continual improvement of energy performance, including energy use, consumption, efficiency and security. The aim of the initiative is to develop a standard for reducing organisational greenhouse gas emissions. The key difference between the ISO 14001 environmental management standard and ISO 50001 is the requirement for an organisational commitment to continuous improvement. This key differentiator demonstrates the organisations willingness and capability to improve their energy footprint and reduce their emissions. Whilst ISO 50001 has been readily deployed in Europe, Australian adoption of the standard has been much more gradual. With the standard optimised against continuous improvement, most implementation costs can be recovered in energy savings in the short term. NOJA Power encourages other enterprises to take on the challenge and work towards a sustainable energy future. 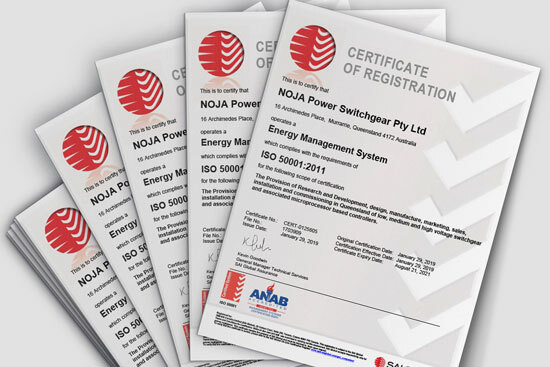 NOJA Power adds the ISO 50001 certificate to their trophy case alongside their other ISO accreditations, including ISO9001, 14001 and 18001/4801. To find out more, visit www.nojapower.com or contact your local NOJA Power Distributor.